Garmin's vívomove analog watch launched with one year battery life and activity tracking features. 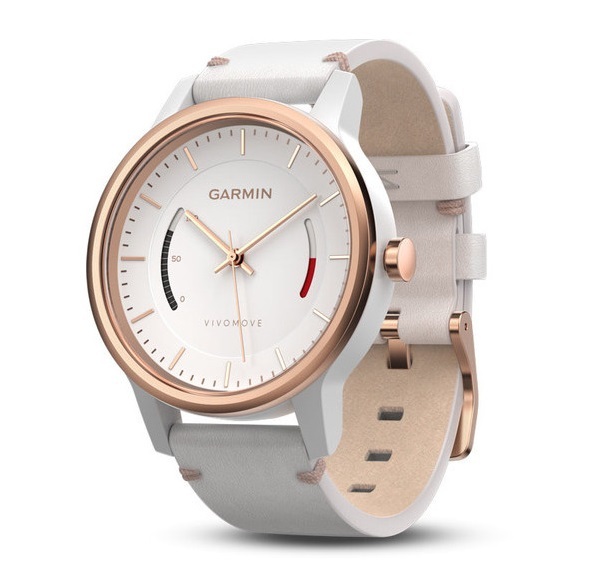 Garmin today launched vívomove, a fashionable analog watch with activity tracking features and one year battery life. Adding style to activity tracking the vívomove combines classic design with function, monitoring steps and sleep and reminding users when they've been inactive too long with its move bar. The watch face features two bars that allow users to view step progress and inactivity at a glance. The bar on the left side of the face shows the progress toward a user's personalized daily step goal. The red bar on the right side of the watch face reminds users when they've been inactive too long, filling half way after one hour of inactivity and building with every 15 minutes after that until its reset by walking for a couple of minutes. The vívomove also tracks how well users slept by monitoring movement and restlessness. Designed to be worn all day vívomove features a timeless analog style face and is available in several models: the sleek vívomove sport, vívomove classic with leather straps, and the more upscale vívomove premium with leather straps and full steel body. With interchangeable leather and silicone strap options and a variety of fashionable case finishes including black, white, rose gold-tone, stainless steel, and gold- tone, the vívomove can be customized to a user's personal style. With one-year battery life, a water rating of 5ATM (50 meters) and a variety of interchangeable bands vívomove is wearable 24/7, no matter the occasion. The vívomove is available in sport (black or white) for $149.99, classic (black with leather band or rose gold-tone with leather band) for $199.99, and premium (stainless steel with leather band or gold-tone steel with leather band) for $299.99.